The American Planning Association, Illinois chapter, sent out a legislation alert this morning about three bills that would prevent government funds from being used to send employees to conferences. I wrote the following letter to my two state representatives. I urge you to vote no on the bills HB4246, HB4247, and HB4248 (“bills”). I am a professional urban planner in Humboldt Park who hopes to have a job with a government agency in Chicago very soon (I’ve applied three times to the same agency, because I want to work there so badly). I have many colleagues, friends, and fellow UIC alumni, who currently work for government agencies in Illinois. 1. It’s an opportunity for the worker to learn the latest knowledge, technology, and practices for their line of work. Government agencies should have high quality workers and staying abreast of new ideas in their field is paramount to a high quality government agency. 2. It’s an opportunity for the government agency to share the results of their internal work with a wider audience, gain recognition, and share and receive best practices from other government agencies. 3. Workers who are certified in their respective industries must attend events to receive “continuing education” credits to ensure they can keep their certification. If the employer isn’t paying for this, then the employee is encouraged to find a job elsewhere that will. I understand that there seems to have been some abuse, at least from what I’ve read in the news about Governor Rauner’s head of the IT department, but these bills are an overbearing and potentially damaging way to deal with that problem. 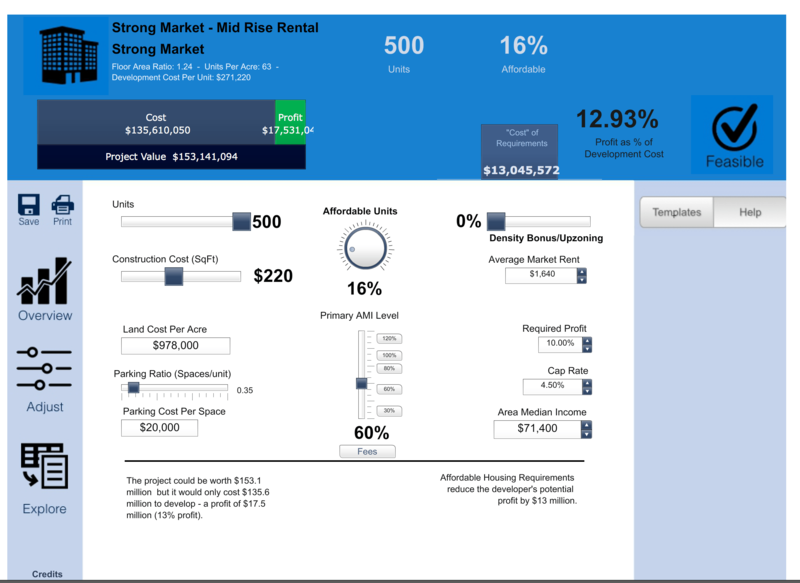 An “inclusionary zoning” calculator can help you determine how much affordable housing your town should require that developers build in their new construction residential buildings. I learned about Grounded Solutions Network’s Inclusionary Housing Calculator at the second-ever YIMBYtown conference in Oakland, California, two weeks ago. YIMBY (yes in my back yard) is a movement to reduce barriers to building more housing in order to be able to house everyone at a level they can afford. It’s a movement for other things, and it means a lot of different things to a lot of different people but the end result is that more housing needs to be built. An interested person inputs a lot of values relevant to their local housing market into the IHC and it will calculate the cost of construction per unit and the rental income from those units, and then will figure the profit margin for the developer. What makes this “inclusionary” is that one also needs to enter the desired portion of units that are set aside as “affordable” (to people making a certain income) and subsidized by the developer’s rental income. I put the IHC through a real world exercise by inputting as much data as I knew about a rejected proposal in Pilsen. The first proposal from Property Markets Group had 500 units, and 16 percent of them were set aside (news on this and their subsequent proposals) [I cannot find the source of the “16 percent on-site” factor]. Chicago’s Affordable Requirements Ordinance, or ARO, requires that 10 percent of the units are affordable, and that 25 percent of those 10 percent must be built on site. The other 75 percent can be built on site, or the developer can pay an in-lieu fee per unit. Needless to say, 16 percent on-site is much, much higher than 25 percent of 10 percent. A neighborhood organization, the Pilsen Land Use Committee, however, requires 21 percent in the area, and the city council member, Danny Solis, 25th Ward, adheres to. PMG said they couldn’t go that high, and that’s what I wanted to test. 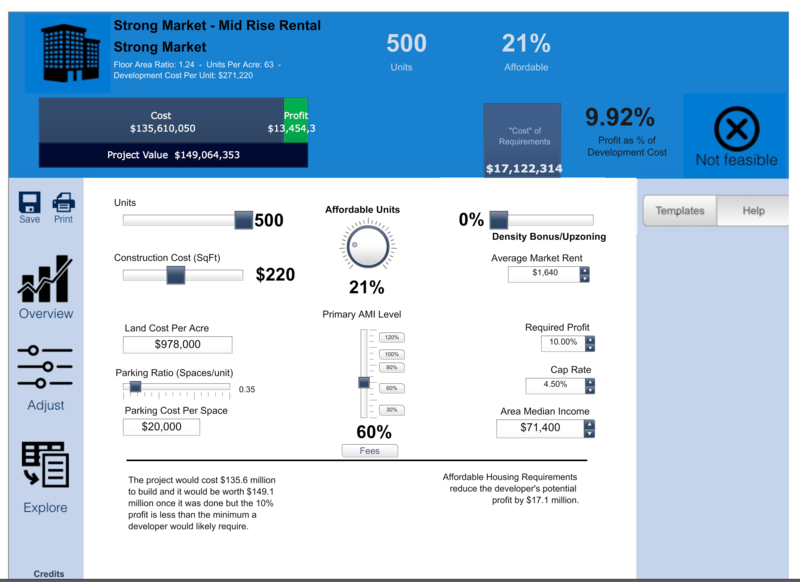 According to this Inclusionary Housing Calculator, could the developer make enough profit (considered as 10 percent) if the building had 21 percent of units as affordable? But the calculator showed that they could earn a 12 percent profit if 16 percent of the units were affordable. Some of the inputs are actual, like the sale price of the land (found in the Illinois Department of Revenue’s transactions database), but I had to make up some inputs, including the apartments’ bedroom mix, and the future rental prices of those apartments. tl;dr: This is the list of all citation types that the Chicago Dept. of Administrative Hearings “administers”. The Freedom of Information Act is my favorite law because it gives the public – and me – great access to work, information, and data that the public – including me – causes to have created for the purpose of running governments. FOIA requires public agencies to publish (really, email you) stuff that they make and don’t publish on their own (which is dumb), and reply to you within five days. All you have to do is ask for it! BUT: Who do you ask? AND: What do you ask them for? This is the hardest thing about submitting a FOIA request. Lately, my friend and I – more my friend than me – have been trying to obtain data on the number of traffic citations issued to motorists for opening their door into traffic – a.k.a. “dooring”. It is dangerous everywhere, and in Chicago this is illegal. In Chicago it carries a steep fine. 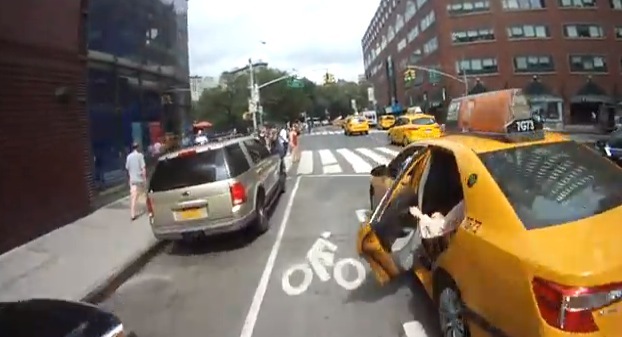 $500 if you don’t hurt a bicyclist, and $1,000 if you do. My friend FOIA’d the Chicago Police Department. You know, the agency that actually writes the citations. They don’t have bulk records to provide. Then he FOIA’d the Chicago Department of Transportation, the Illinois Department of Transportation, the Chicago Department of Administrative Hearings, and the Chicago Department of Finance. Each of these five agencies tells you on their website how to submit a FOIA request. You can also use FOIA Machine to help you find a destination for your request. None of them have the records either. The “FOIA officer” for the Administrative Hearings department suggested that he contact the Cook County Circuit Court. So that’s what we’re doing. Oh, and since the Administrative Hearings department doesn’t have this information (even though they have the records of citations for a lot of other traffic violations), I figured I would ask for them for a list of citations that they do have records of. And here’s the list, all 3,857 citation types. You’ll notice a lot of them don’t have a description, and some of very short and unclear descriptions. Hopefully you can help me fix that! I can grant you editing access on the Google Doc and we can improve this list with some categorizations, like “building violations” and “vehicle code”. Alders Ameya Pawar (47th), Pat O’Connor (40th), Joe Moreno (1st) and Pat Dowell (3rd) are introducing a resolution at today’s budget committee to ask all alders to choose and stop certain TIF-funded projects in their wards (instructions on how to find TIF districts are below) so that the money can be declared as a surplus. Part of the surplus would be given to the Chicago Public Schools, where it would have gone had property tax revenue never been diverted to the TIF. What is TIF? Quick answer: All of the new property tax revenue generated after the date the “Tax Increment Financing” district took effect goes to a fund that can only be spent on certain kinds of projects within that district, while all of the property tax revenue generated at the amount that was collected just before the district took effect continues to go to the city, the school district, and other taxing districts. Alder Pawar has already picked $16.5 million worth of projects that he’s stopping in order to give back the money to schools. It’s still very difficult to know how much unallocated money is in a TIF district’s bank account (what is essentially surplus). It’s also still very difficult to figure out which projects have had money allocated to them (called an obligation) but not yet spent. Rather than allowing Mayor Rahm Emanuel and his budget office to decide where to sweep for TIF surplus dollars, Pawar said aldermen should be leading the effort, stating which TIF projects they’re willing to give up. You can use Chicago Cityscape’s Places maps to easily find which TIF districts overlap any of the 50 wards. Find your ward. Use the 3rd Ward, Alder Pat Dowell because Wetli already explored the 47th Ward TIF districts. Scroll down to the table called “3rd Ward, Ald. Pat Dowell’s Nearby Places”. Type “TIF district” in the table’s search form. Gasp at the fact that there are 17 districts that overlap the 3rd Ward. This screenshot shows 10 of the 17 TIF districts that overlap the 3rd Ward. Let’s look deep at the TIF district called “24th/Michigan”, 76.7 percent of which is in the 3rd Ward, has several millions of dollars in obligations to vaguely-described projects, to continue paying for already-built projects, or future projects. This includes $6.4 million for the Cermak Green Line station and $4.5 million annually for an unspecified project at the National Teachers Academy pursuant to an intergovernmental agreement with the Chicago Public Schools. A map of the 24th/Michigan TIF district. The National Teachers Academy project isn’t even on the city’s mildly useful TIF projects map. Alder Dowell has her work cut out for her to find projects that are in both the 3rd Ward and in one of the 17 intersecting TIF districts that she would be willing to cut so that the Chicago Public Schools are less broke. The same arduous but noble task belongs to all of the other alders as well. Adrienne Alexander speaking to ChiHackNight at Braintree. Photo by Chris Whitaker. ChiHackNight is Chicago’s weekly event to build, share & learn about civic tech. Me and 100 of my friends (50 of whom are new every week!) meet in the Braintree auditorium on Tuesday nights at 6 p.m. on the 8th floor of the Merchandise Mart. Sign up for notifications on upcoming presenters. The content of my blog post is derived from real-time note taking. 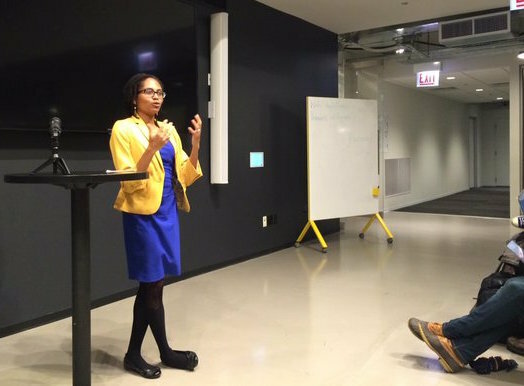 Adrienne Alexander, or @DriXander on Twitter, came to ChiHackNight last night to tell us about her experience as a lobbyist working for the state’s largest public employees union. She lobbies the Chicago City Council and the Illinois state legislature for bills and budget modifications that would impact the members of the American Federation of State, County and Municipal Employees council 31. Members of AFSCME (afs-me) are staff at numerous Chicago city departments and in state government. Alexander watches new bills that come in and analyzes what their impact might have on its members. Alexander, however, had been battling efforts to privatize city functions earlier. In 2011, she said, Mayor Rahm Emanuel was trying to privatize the water billing group. This would have been realized by amending the budget and reducing the amount budgeted for that group of staff. “We represented those folks”, she said. “It got a lot of aldermen upset, it was supposed to save $100,000 annually but also lay off 40 people.” It didn’t happen. And neither did the 311 privatization that Emanuel proposed in 2015 for the 2016 budget. Alexander said that it was hard to keep the press focused on this issue for three years, because nothing was happening. “If there’s nothing happening, they would say, then there’s nothing to write about”, she said. It was passed in November 2015. “It’s hard to get things passed that don’t have the mayor’s support,” Alexander said. “A lot of the calls the aldermen get are not about policy, but about alleys, trash, tree trimming, these very ‘quality of life’ issues specific to their ward”. Micklin led the development of “My Building Doesn’t Recycle”, a map where Chicagoans can report that their multi-unit building doesn’t have a third-party recycling service (required if the tenants of a building with 5 or more units request it). Alexander said “I think there’s not so much a culture of [alders generating their own policy initiatives] here, but I think it’s possible”. Make sure they’re hearing about it from different places, and find out who else they’re listening to. In each ward, she said, there’s at least one organization that an alder really cares about, so if that organization is making something an issue, or it would be beneficial to that organization, then they could be helpful. I’ve seen this kind of organization-derived influence a lot in property development matters. If there’s a neighborhood-based organization that purports to represent resident issues in a specific boundary, then the alder who’s receiving a new property development proposal will ask that the developer meet with the organization to gain their approval. I’ve seen situations, especially in the 1st Ward, where the alder supports the development if the organization supports the development. The City of Chicago released a trove emails spread over eight PDF files containing 3,000 pages, on New Year’s Eve, wherein city staff, including from the mayor’s office, police department, law department, discussed how they should handle countless requests from the media for information about the police shooting of Laquan McDonald. In the middle of the night on October 20, 2014, Chicago police officer Jason Van Dyke shot 17-year-old Laquan McDonald 16 times, killing him. Over a year later, a dashcam video of the shooting was released, sparking protests, theresignation of Chicago’s Police Chief, a federal investigation, and calls for the Mayor and State’s Attorney to resign. I set to work that night reading as many as I could, and gathering strangers on Twitter to help read and catalog them. This blog post is intended to point to the Google Sheet where we – over a dozen people who congregated here via Twitter – recorded the details of each message, including what it said, what we think the communicators meant, and what information was missing. Read the Laquan McDonald emails catalog. Virtually all new multi-unit housing developments in Chicago outside the CBD are because of the city’s Transit-Oriented Dev’t ordinance. This is the ordinance that says residential developments have to provide 0.5 car parking spaces per home, and that the minimum home size can be smaller. How many units? At least 1,500. Here’re the 19 buildings I know about that are being built within 600 and 1,200 feet* of a Chicago Transit Authority ‘L’ station – the only areas, essentially, where multi-family housing can be developed. How do I know popular neighborhoods are zoned for single-family use? 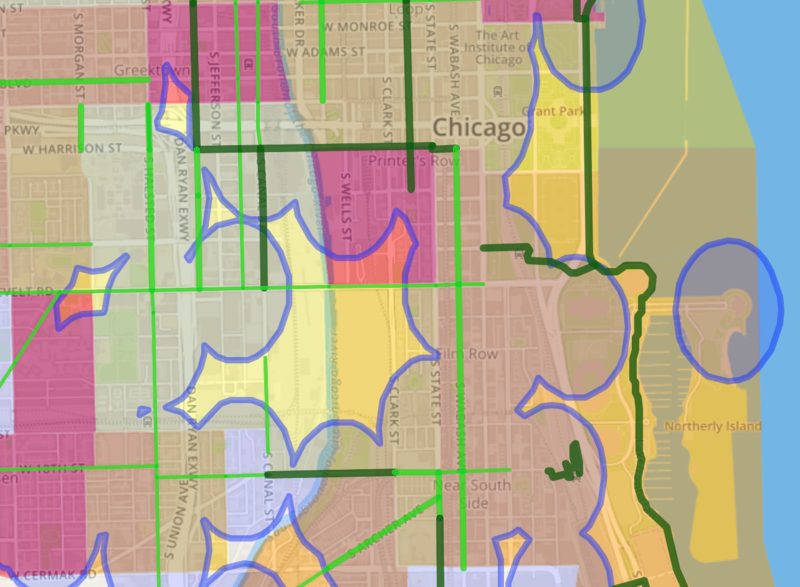 Because Daniel Hertz’s new Simplified Chicago Zoning Map makes it easy to see. Yep, even along those dense business districts and even outside the train stations. Do the single-family home zones contain single-family homes now? Absolutely not! Much of the buildings in areas zoned for single-family homes have everything but! The particular view of the map that Hertz uses in his blog post shows that even adjacent to CTA stations, and within 1 block, there are only single-family zones (in red). There are many multi-family buildings in these red zones. Red areas are zoned for single-family homes only. View the map. What ends up happening there? Teardowns. And the Lakeview Chamber of Commerce finds believes that non-matching zoning – it matches neither the existing uses nor the needs for the neighborhood – and teardowns are going to cut into consumer spending on its lively retail streets. Lakeview is seeing a population change to families which tend to have less disposable income. More housing in a popular neighborhood means more shoppers, more property taxes, more “boots on the ground”, more “pedestrian congestion” in front of our local businesses. Doesn’t the ordinance make station-adjacent parcels friendly to multi-family housing because of the TOD ordinance? Yes, and no. As Hertz points out, “virtually every sizable development involves a zoning variance or planned development process that goes beyond the zoning you’ll see on the map”. The TOD ordinance is 19 months old and working exactly as intended, building more housing next to train stations, and giving more people the opportunity to have access to affordable transportation. So it needs an upgrade to be able to do more. Since, in Chicago, zoning is our land use plan, we need the best kind of zoning rules and this is one of the best. Imagine what the TOD ordinance could do if it were expanded. Think, making the parking requirement relief and allowing different unit sizes by-right instead of going through an arduous and expensive zoning change process. Then, expanding the rule to include more than just 600 feet (which is less than a block) from a train station – people walk several blocks to get to CTA stations, and bike even more. And, beefing up the affordable housing requirements. Let’s do this, Commissioner Andrew Mooney. Let’s do this, housing advocates. Let’s do this, transit advocates. I’m looking at you, Latin United Community Housing Association (LUCHA), Logan Square Neighborhood Association (LSNA), We Are/Somos Logan Square, Pilsen Alliance, Metropolitan Planning Council (MPC), Active Transportation Alliance, and the Center for Neighborhood Technology (CNT). * The distance depends on existing Pedestrian Street zoning. If the property is on a designated Pedestrian Street then the station can be up to 1,200 for the ordinance to apply, double the normal 600 feet. Turf’s merge function joins invisible buffers around each Divvy station into a single, super buffer –all client-side, in your web browser. I’m leading the development of a website for Slow Roll Chicago that shows the distribution of bike lane infrastructure in Chicago relative to key and specific demographics to demonstrate if the investment has been equitable. All of our research and code should be public and open source so it’s clear how we made our assumptions and came to our conclusions (“show your work”). Using git, GitHub, and version control is a desirable skill and more people should learn it; this project will help people apply that skill. The website focuses on using empirical research, maps, geographic analysis to tell the story of bike lane distribution and requires processing this data using GIS functions. Normally the data would be transformed in a desktop GIS software like QGIS and then converted to a format that can be used in Leaflet, an open source web mapping library. Relying on desktop software, though, slows down development of new ways to slice and dice geographic data, which, in our map, includes bike lanes, wards, Census tracts, Divvy stations, and grocery stores (so far). One would have to generate a new dataset if our goals or needs changed . I’ve built maps for images and the web that way enough in the past and I wanted to move away from that method for this project and we’re using Turf.js to replicate many GIS functions – but in the browser. Yep, Turf makes it possible to merge, buffer, contain, calculate distance, transform, dissolve, and perform dozens of other functions all within the browser, “on the fly”, without any software. Buffer and dissolving buffers to show the Divvy station walk shed, the distance a reasonable person would walk from their home or office to check out a Divvy station. A buffer of 0.25 miles (two Chicago blocks) is created around each of the 300 Divvy stations, hidden from display, and then merged (dissolved in traditional GIS parlance) into a single buffer. The single buffer –called a “super buffer” in our source code – is used for another feature. Currently the projection is messed up and you see ellipsoid shapes instead of circles. Counting grocery stores in the Divvy station walk shed. We use the “feature collection” function to convert the super buffer into an object that the “within” function can use to compare to a GeoJSON object of grocery stores. This process is similar to the “select by location” function in GIS software. Right now this number is printed only to the console as we look for the best way to display stats like this to the user. A future version of the map could allow the user to change the 0.25 miles distance to an arbitrary distance they prefer. 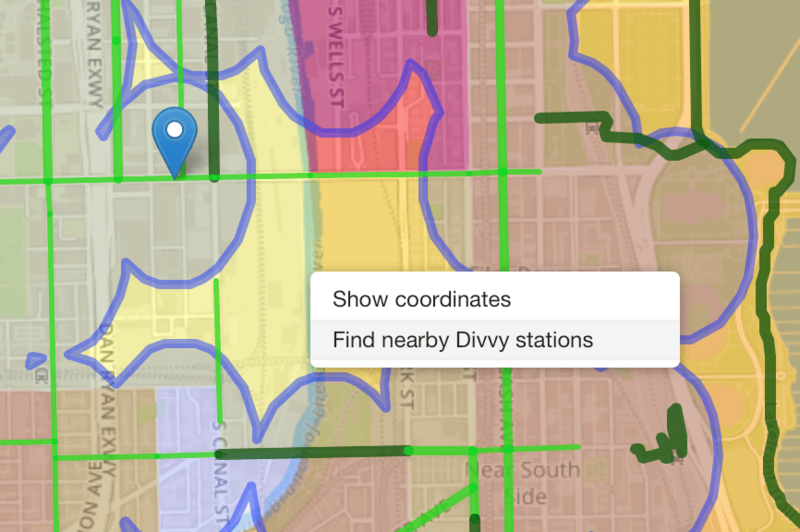 Find the nearest Divvy station from any place on the map. Using Turf’s “nearest” function and the Context Menu plugin for Leaflet, the user can right-click anywhere on the map and choose “Find nearby Divvy stations”. The “nearest” function compares the place where the user clicked against the GeoJSON object of Divvy stations to select the nearest one. The problem of locating 2+ nearby Divvy stations remains. The original issue asked to find the number of Divvy stations near the point; we’ll likely accomplish this by drawing an invisible, temporary buffer around the point and then using “within” to count the number of stations inside that buffer and then destroy the buffer. Right-click the map and select “Find nearby Divvy stations” and Turf will locate the nearest Divvy station. * I send one email to new people who join us at Open Gov Hack Night on Tuesdays at the Mart to send them a link to our GitHub repository, and to invite them to a Dropbox folder to share large files for those who don’t learn to use git for file management. John and I at Taqueria La Zacatecana in Avondale, where we first hashed out the details of what would become Grid Chicago that later transitioned into Streetsblog Chicago. I haven’t talked about this here, but two months ago this weekend I got the message that Streetsblog Chicago wouldn’t continue because we didn’t raise enough money in the last fundraising round. I didn’t talk about it here because I was busy with dealing with shutting that down, working with my partner John Greenfield to come up with a transition plan (to resurrect the site) and because I have myriad side projects that quickly and easily captured my newly-available attention. I eased right into developing those more and into involving myself in new jobs on a freelance basis. Our readers dutifully expressed their support for my and John’s work at Streetsblog Chicago – providing an alternative voice for transportation and land use policy discussion. The most heartening and unexpected expressions have come from the very agencies on which we report and criticize. Our reporting was thoughtful and necessary they said, even though, and this has been unanimous, they sometimes disagreed with our perspective. I believe their appreciation of our work has always been there but there was never a good moment, or a necessity, for them to make it known. It’s heartening to know that our writing – advocating for safer streets, funding allocation that promoted efficient and active transportation, converting street space from moving cars quickly to moving people – was making its way in the corridors of the bureaucracies and street managers and place makers and bus operators. I think what we did with Streetsblog Chicago was necessary, too, and I waited and worked to make it happen since 2007. I bided my time with this blog until meeting editor-in-chief Ben Fried in 2010. The conditions weren’t right then, and a friend at a 2011 Star Trek watching party (don’t ask) in Logan Square put me and John together after which we made the next best thing: Grid Chicago. I want to keep writing Streetsblog Chicago and we need your help. John and I are raising $75,000 to resume publishing at very-close-to-before rate of five to seven original posts per week. Donate now. We’ve already raised $36,905 and the Chicago Community Trust will give us $25,000 when we reach $50,000. The catch is that we must get there by April 8. Otherwise we’ll return all of the donations. Since the January 8 hiatus we held a fundraiser in the pedway, which Moxie founder Daniel Ronan organized. We’ll be holding another fundraiser in Revolution Brewing’s taproom on Kedzie on Wednesday, March 26, at our donor appreciation party: Everyone is welcome but those who donate $100 on or before the party will get John’s book “Bars Across America” and their first round on the house. I’m also putting together a tour of developments around Chicago near transit stations that have taken advantage of a city ordinance reducing their parking minimum. Save the date, Saturday, April 4.